Lensun ETFE 160W, 12V Ultralight Folding Solar Panel with 20A Solar controller. The Ideal way to power everyday lifestyle needs; Blogging, Photography,Camping, Vans, RVs, Motorhomes, Caravans, Boats, Yachts, Cabins, and Sporting Events. Also Capable of Charging Your Android, iPhones, iPad and Other 12V Devices, Laptops, Tablets, Kindles, Cameras, Speakers, Electric Bikes, Electric Motorcycles and Chargers Via USB and DC Outputs. Great For Travelers and Bloggers. 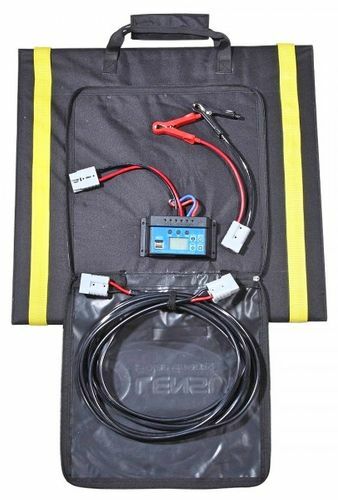 Works well with most inverters and batteries and also with "Lensun Portable Solar Generators", found here on TheSolPatch.com - all sold separately. 2. Designed with no metal frames or glass. 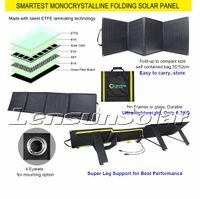 Durable, Ultra-lightweight, Only 5.6kgs, 1/5 of normal aluminium frame, folding solar panels. 7. Complete Kits: 12/24V PWM 20A solar controller and solar cables with battery clips and Anderson connectors. Net. Weight: 5.6kgs/ 12 lbs.